"One People, one Realm, one Leader." Nazi Germany in 1941, prior to the invasion of the Soviet Union. a From 1943–45. From 1933 to 1943: Deutsches Reich ("German Reich"). The German state is identically the very same because it exists as a nation state since 1871. In 1949, at East–West Germany division there was no foundation of a new Germany, instead of that there were only formations or reorganizations. The GDR alleged an own foundation, and it saw itself as a succession of Germany (but in fact it only was part of it like West Germany). c Office declared vacant upon Hindenburg's death, allowing Chancellor Hitler to name himself "Führer and Chancellor." dThe word "Reich" in "German Reich" is best described as "realm" under definition of a "region, sphere, or domain within which anything occurs, prevails, or dominates," in this case the realm of the German people. This definition is also applicable to the Weimar Republic which was not an empire. Other translations such as "realm" meaning empire, nation, or state are in a literal sense incorrect as their literal definitions are the "Kaiserreich/Kaisertum," "Land," and "Staat." Nazi Germany, or the Third Reich—officially called Deutsches Reich and later Großdeutsches Reich, or literally translated "Great German Realm" often translated as "Greater German Empire" (the word "greater" in German is "größeres" not "groß"; the word "Kaiserreich," and in some cases "Kaisertum," is the literal translation of empire)—refers to Germany in the years of 1933 to 1945, when it was governed by the dictatorship of the Nationalsozialistische Deutsche Arbeiterpartei (National Socialist German Workers' Party), abbreviated as Nazi Party, with Adolf Hitler as chancellor and, from 1934, as head of state called the Führer (Leader) who ruled Germany under a totalitarian dictatorship until 1945. The policies pursued by Nazi Germany, based on the concept of Lebensraum, "Aryan," Nordic racial purity, anti-Semitism, revenge for Germany's territorial losses and perceived loss of national pride at the Treaty of Versailles, and anti-communism directed at the Soviet Union were among the leading causes of the Second World War and the Nazi regime's systematic mass murder of millions of Jews and other minorities in the genocide known as the Holocaust or Shoah. The Holocaust was characterized by the efficient and systematic attempt on an industrial scale to assemble and kill as many people as possible, using all of the resources and technology available to the Nazi state. Approximately eleven million victims died, of whom about six million were Jews. Thousands of others were imprisoned. Other regions were acquired after the outbreak of conflict, but had been part of Imperial Germany prior to the Treaty of Versailles and had varying German populations: Eupen-et-Malmédy, Alsace-Lorraine, Danzig and parts of Poland. Outside of what was directly annexed into Germany, were regional territories created in occupied land. In the occupied areas of the Soviet Union, occupational territories were called Reichskommissarats. These included Reichskommissariat Ostland and Reichskommissariat Ukraine, which were designed to foster German colonization of Eastern Europe. In northern and western Europe, occupation authorities aided by Nazi sympathizers ran the governments of Belgium, Denmark, the Netherlands, Norway, and northern France (after 1942, all of France). In parts of northern France, travel restrictions were imposed by the Nazi occupation authorities, as the Nazi regime intended to colonize those areas with German citizens. The Reich's borders had changed de facto well before its military defeat in May 1945, as the German population fled westward from the advancing Red Army and the Western Allies pressed eastward from France, to fight one final major battle called the Battle of the Bulge. By the end of the war, a small strip of land stretching from Austria to Bohemia and Moravia—as well as a few other isolated regions—were the only areas not under Allied control. Upon its defeat, the Reich was in a state of debellation and was replaced by occupation zones administrated by France, the Soviet Union, the United Kingdom and the United States. The prewar German lands east of the Oder-Neisse line and Stettin and its surrounding area were permanently sundered from Germany for annexation by Poland and the Soviet Union. The Nazi Party used the terms Drittes Reich and Tausendjähriges Reich ("Thousand-Year Realm/Empire") to describe the greater German ethnic empire they wished to forge. The term Third Reich referred to the Nazi recognition of former incarnations of important German realms while alluding to envisioned future prosperity and the new nation's alleged destiny. But on July 10, 1939, it was dropped from propaganda at Hitler's behest. The Holy Roman Empire ("Heiliges Römisches Reich," later with the appendage "Deutscher Nation"), deemed the First Empire or First Reich, had lasted almost a thousand years from 843 to 1806. The term Tausendjähriges Reich was used only briefly and also dropped from propaganda in 1939, officially to avoid mockery and possibly to even avoid religious connotations. In speeches, books and articles about the Third Reich after May 8, 1945, the phrase has taken on a new meaning and the early Nazi professions about a "thousand year" empire are often juxtaposed against the 12 years that the Third Reich actually existed. The official name of Germany did not change after the Nazis came to power in 1933. It remained Deutsches Reich (literally translated as German Realm), the same as it had been since 1871. It was only in 1943 that the Nazi government officially modified the name of Germany, calling it Großdeutsches Reich (Greater German Realm), which remained in use until the defeat of Nazi Germany in May, 1945. The term was taken by the Nazis from the 1923 book Das Dritte Reich ("The Third Reich"), by the cultural historian and writer Arthur Moeller van den Bruck - who was an anti-Versailles German nationalist, but far from enthusiastic about Hitler whom he met in 1922. The Nazi regime took its ideological basis mainly from the ideals of Pan-Germanism, anti-Semitism, and Social Darwinism. Propaganda accredited all of the ideals and successes of the regime to regime's leader, or Führer, Adolf Hitler, who was portrayed by himself and propaganda as the genius behind the Nazi party's success and Germany's savior. Hitler's ability to grasp the attention of audiences through his powerful speeches helped him earn a cult following by his Nazi followers. The Nazis endorsed the concept of "Großdeutschland," or Greater Germany, and believed that the incorporation of the Germanic people into one nation was a vital step towards their national success. While the Nazis proposed the creation of an all-encompassing German ethnic State, others, particularly non-Germans, were in strong opposition to the idea, believing that a very large and powerful Germany would be to the disadvantage of the rest of Europe. Similarly, the "German problem," as it is often referred to in English scholarship, focuses on the issue of administration of Germanic regions within Northern and Central Europe, an important theme throughout German history. The "logic" of keeping Germany small worked in the favor of its principal economic rivals, and had been a driving force in the recreation of a Polish state. The goal was to create numerous counterweights in order to "balance out Germany's power." Regardless of one's position on these matters, it was the love affair with the Volk concept that led to Germany's expansion, culminating in World War II. Two important issues were administration of the Polish corridor and Danzig's incorporation into the Reich. As a further extension of racial policy, the Lebensraum program, adapted in the midst of the war, pertained to similar interests; it was decided that Eastern Europe would be settled with ethnic Germans, and the Slavic population who met the Nazi racial standard would be absorbed into the Reich. Those not fitting the racial standards were to be used as cheap labor force or deported eastward. Racism was an important aspect of society within the Third Reich. The Nazis also combined anti-Semitism with anti-Communist ideology and regarded the leftist movement - as well as international market capitalism - as the work of "Conspiratorial Jewry." They referred to this so-called movement as the "Jewish-Bolshevistic revolution of subhumans." This platform manifested itself in the displacement, internment and later, the systematic extermination of an estimated 11 to 12 million people in the midst of World War II, roughly half of whom being Jews targeted in what is historically remembered as the Holocaust (Shoah), and another 100,000-1,000,000 being Roma, who were murdered in what they call the Porajmos. Other victims of Nazi persecution included Slavic populations in and outside of Slavic countries, blacks, political opponents, social outcasts, homosexuals, religious dissidents such as Jehovah's Witnesses and Freemasons, and unyielding Church-affiliated leadership (Confessing Church of German Lutherans and resisting Roman Catholic clergy). World War II officially began after Nazi Germany invaded Poland on September 1, 1939, which led to France and the United Kingdom both declaring war on Nazi Germany. The global conflict that followed left Europe in ruins and led to the deaths of roughly 62 million people. In the wake of the loss of land and perceived national humiliation imposed through the Treaty of Versailles, civil unrest, the worldwide economic depression of the 1930s, the counter-traditionalism of the Weimar period and the threat of Soviet-sponsored communism in Germany, many voters began turning their support towards the Nazi Party, which promised strong government, an end to civil unrest, radical changes to economic policy, cultural renewal based on traditionalism, military rearmament in opposition to the Treaty of Versailles, and to bring back national pride that the Nazis claimed was lost in the Treaty of Versailles and the creation of liberal democracy.. The Dolchstosslegende figured prominently. On January 30, 1933, Hitler was appointed chancellor of Germany by President Paul von Hindenburg after attempts by General Kurt von Schleicher to form a viable government failed. Hindenburg was put under pressure by Hitler through his son Oskar von Hindenburg, as well as intrigue from former Chancellor Franz von Papen following his collection of participating financial interests and own ambitions to combat communism. Even though the Nazi Party had gained the largest share of the popular vote in the two Reichstag general elections of 1932, they had no majority of their own, and just a slim majority in parliament with their Papen-proposed Nationalist DNVP-NSDAP coalition. This coalition ruled through accepted continuance of the Presidential decree, issued under Article 48 of the 1919 constitution. The Nazi attacks on the Jews in the early months of 1933 marked the first step in a longer-term process of removing them from German society. By the summer of 1933, this process was on its way to becoming quite disastrous. This process also marked the core of Hitler's "cultural revolution" whereby the Nazi mind had begun to transform in a manner conducive to anti-Semitism, anti-communism, and anti-liberalism. On the night of February 27, the Reichstag building was set on fire, and inside a Dutch council communist, Marinus van der Lubbe, was found. He was arrested and charged with starting the fire. Historians still cannot agree on who was to blame for the Reichstag fire as it could have been either; Van der Lubbe acting alone, Van der Lubbe acting as part of a Communist plot, or the Nazis who started the fire themselves in order to gain full power. Whatever the case may be, Van der Lubbe was the scapegoat the Nazis needed in order to convince the German people that communists were trying to take over. This event gave the Nazis an excuse to act against the thousands of anarchists, socialists and communists scattered throughout the Reich (many were sent to the Dachau concentration camp), thus removing political dissidents. The event was quickly followed by the Reichstag Fire Decree, rescinding habeas corpus and other civil liberties. The Enabling Act was passed in March 1933, with 444 votes, to the 94 of the remaining Social Democrats. The act gave the government (and thus effectively the Nazi Party) legislative powers and also authorized it to deviate from the provisions of the constitution for four years. With these powers, Hitler removed the remaining opposition and turned the Weimar Republic into the "Third Reich." In order for Hitler to create the Nazi dictatorship in Germany, it had to become a one party state. This was easily achieved by the Nazis as by June 1933 the Social Democrats had been banned, the Communists had been banned and the German Nationalists (DNVP), German People's Party (DVP) and German Democratic Party (DDP) had all been forced to disband. The remaining Catholic Centre Party disbanded themselves on July 5, 1933 after guarantees over catholic education and youth groups. On July 14, 1933 Germany officially declared a one party state with the passing of the Law against the formation of parties. Further consolidation of power was achieved on January 30, 1934, with the Gesetz über den Neuaufbau des Reichs (Act to rebuild the Reich). The act changed the highly decentralized federal Germany of the Weimar era into a centralized state. It disbanded state parliaments, transferring sovereign rights of the states to the Reich central government and put the state administrations under the control of the Reich administration. Only the army remained independent from Nazi control. The German army had traditionally been somewhat separate from the government. The Nazi quasi-military SA expected top positions in the new power structure. Wanting to preserve good relations with the army, on the night of June 30, 1934, Hitler initiated the violent Night of the Long Knives, a purge of the leadership ranks of Röhm's SA as well as other political enemies, carried out by another, more elitist, Nazi organization, the SS. At the death of president Hindenburg on August 2, 1934, the Nazi-controlled Reichstag merged the offices of Reichspräsident and Reichskanzler and reinstalled Hitler with the new title Führer und Reichskanzler. Until the death of Hindenburg, the army did not follow Hitler. However, with the death of Hindenburg, the entire army swore their obedience to Hitler. The inception of the Gestapo, police acting outside of any civil authority, highlighted the Nazis' intention to use powerful, coercive means to directly control German society. Soon, an army estimated to be of about 100,000 spies and infiltrators operated throughout Germany, reporting to Nazi officials the activities of any critics or dissenters. Most ordinary Germans, happy with the improving economy and better standard of living, remained obedient and quiet, but many political opponents, especially communists and Marxist or international socialists, were reported by omnipresent eavesdropping spies, and put in prison camps where they were severely mistreated, and many tortured and killed. It is estimated that tens of thousands of political victims died or disappeared in the first few years of Nazi rule. Nazi social policy was dominated by the desire to create a "perfect" race. Racial purity was demanded by the Nazis and created racist laws, pursued ethnic persecution, and enacted many social welfare policies to benefit "Aryan" Germans, others, specifically Jews, Roma, homosexuals, and other minorities were excluded from these programs. The "yellow badge" required to be attached to clothing worn by Jews in public in Nazi Germany and occupied territories. The Nazi Party pursued its racial policy aims through persecution and killing of those considered "impure," especially targeting minority groups such as Jews, Roma (also known as Gypsies), colored people, Jehovah's Witnesses, Slavs, people with mental or physical disabilities, and homosexuals. In the years following the Nazi rise to power, many Jews fled the country and were encouraged to do so. By the time the Nuremberg Laws were passed in 1935, Jews were stripped of their German citizenship and denied government employment. Most Jews employed by Germans lost their jobs at this time, which were being taken by unemployed Germans. Notably, the Nazi government attempted to send 17,000 German Jews of Polish descent back to Poland, a decision which led to the assassination of Ernst vom Rath by Herschel Grynszpan, a German Jew living in France. This provided the pretext for a pogrom the Nazi Party incited against the Jews on November 9, 1938, which specifically targeted Jewish businesses. The event was called Kristallnacht (Night of Broken Glass, literally "Crystal Night"); the euphemism was used because the numerous broken windows made the streets look as if covered with crystals. By September 1939, more than 200,000 Jews had left Germany, with the Nazi government seizing any property they left behind. A member of the U.S. Congressional Nazi crimes committee visiting Buchenwald concentration camp shortly after its liberation. Another component of the Nazi programme of creating racial purity was the Lebensborn, or "Fountain of Life" programme founded in 1936. The programme was aimed at encouraging German soldiers—mainly SS—to reproduce. This included offering SS families support services (including the adoption of racially pure children into suitable SS families) and accommodating racially-valuable women, pregnant with mainly SS men's children, in care homes in Germany and throughout Occupied Europe. Lebensborn also expanded to encompass the placing of racially pure children forcibly seized from occupied countries—such as Poland—with German families. In the 1930s, plans to isolate and eventually eliminate Jews completely in Germany began with the construction of ghettos, concentration camps and labor camps. In 1942, at the Wannsee Conference, Nazi officials made clear their intention to eliminate the Jews of Europe as quickly as possible, when they discussed the "Final Solution of the Jewish Question." Extermination camps like Auschwitz used gas chambers to kill as many Jews as possible and cremated the bodies. By 1945, a number of concentration camps had been liberated by Allied forces who found the survivors to be severely malnourished from starvation. The Allies also found evidence that the Nazis were profiteering off of the mass murder of Jews not only by confiscating their property and personal valuables but also by extracting gold-fillings from the bodies of some Jews held in concentration camps. Recent research by academics such as Götz Aly has emphasized the role of the extensive Nazi social welfare programs that supposedly helped maintain public support for the regime that lasted long into the war. The idea of a national German community was heavily focused on, and labor and entertainment—from festivals, to vacation trips and traveling cinemas—were all made a part of the "Strength through Joy" (Kraft durch Freude) program. Also crucial to the building of loyalty and comradeship was the implementation of the National Labor Service and the Hitler Youth Organization, with the former being compulsory and the latter consisting of nearly six million boys and girls. In addition to this, a number of architectural projects were undertaken. The construction of the Autobahn made it the first National Motor Highway system in the world. Between 1933 and 1936, Germany outpaced the United States in construction, automobile production and employment. According to the research of Robert N. Proctor for his book The Nazi War on cancer, Nazi Germany had arguably the most powerful anti-tobacco movement in the world. Anti-tobacco research received a strong backing from the government, and German scientists proved that cigarette smoke could cause cancer. German pioneering research on experimental epidemiology lead to the 1939 paper by Franz H. Müller, and the 1943 paper by Eberhard Schairer and Erich Schöniger which convincingly demonstrated that tobacco smoking was a main culprit in lung-cancer. The government urged German doctors to council patients against tobacco use. German research on the dangers of tobacco was silenced after the war, and the dangers of tobacco had to be rediscovered by American and English scientists in the early 1950s, with a medical consensus arising in the early 1960s. German scientists also proved that asbestos was a health hazard, and in 1943, as the first nation in the world, recognized the diseases caused by asbestos, e.g., lung cancer, as occupational illnesses eligible for compensation. The German asbestos-cancer research was later used by American lawyers doing battle against the JohnsManville corporation. As part of the general public health campaign in Nazi Germany water supplies were cleaned up, lead and mercury were removed from consumer products, and women were urged to undergo regular screenings for breast cancer. One of the first acts of the new regime was to enact an animal protection law. The implemented law on animal protection was stringent and restricted research. The law restricted the use of animals for research in experiments . Hitler signed a Treaty with the Vatican, the Reichskonkordat, July 20, 1933. This guaranteed the Roman Catholic Church certain rights. In return, although the Church was aware of the excesses of the regime, including the systematic murder of Jews and other victims of Nazi ideology, it remained silent. Protestants were not at the time organized into a single, national church. Hitler encouraged this process and on June 23, 1933 Ludwig Müller, a Nazi, became Chair of a Council of regional churches. This was then reconstituted as a Reich Church, with Müller as Reich bishop. Those who remained outside of this national German Church, whose clergy has to subscribe to the superiority of the German people and recognize Hitler as 'lord' of the Church, joined what was called the Confessing Church. The Confessing Church denounced Hitler's dictatorial rule as well as what they saw as Hitler-worship, but did not speak out against his racist policies. When the Nazis came to power the most pressing issue was an unemployment rate of close to 30 percent. The economic management of the state was first given to respected banker Hjalmar Schacht. Under his guidance, a new economic policy to elevate the nation was drafted. One of the first actions was to destroy the trade unions and impose strict wage controls. The government then expanded the money supply through massive deficit spending. However at the same time the government imposed a 4.5 percent interest rate ceiling, creating a massive shortage in borrowable funds. This was resolved by setting up a series of dummy companies that would pay for goods with bonds. The most famous of these was the MEFO company, and these bonds used as currency became known as MEFO bills. 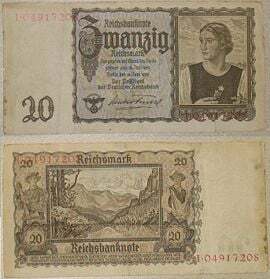 While it was promised that these bonds could eventually be exchanged for real money, the repayment was put off until after the collapse of the Reich. These complicated manoeuvres also helped conceal armament expenditures that violated the terms of the Treaty of Versailles. Most industry was not nationalized; however, industry was closely regulated with quotas and requirements to use domestic resources. These regulations were set by administrative committees composed of government and business officials. Competition was limited as major companies were organized into cartels through these administrative committees. Selective nationalization was used against businesses that failed to agree to these arrangements. The banks, which had been nationalized by the Weimar Republic, were returned to their owners and each administrative committee had a bank as member to finance the schemes. While the strict state intervention into the economy, and the massive rearmament policy, led to full employment during the 1930s, real wages in Germany dropped by roughly 25 percent between 1933 and 1938. Trade unions were abolished, as well as collective bargaining and the right to strike. The right to quit also disappeared: Labor books were introduced in 1935, and required the consent of the previous employer in order to be hired for another job. The German economy was transferred to the leadership of Hermann Göring when, on October 18, 1936, the German Reichstag announced the formation of a Four-Year Plan. The Nazi economic plan aimed to achieve a number of objectives. Under the leadership of Fritz Todt, a massive public works project, the Reichsarbeitsdienst, was started, rivaling Roosevelt's New Deal in both size and scope. It functioned as a military-like unit, its most notable achievements being the network of Autobahnen and, once the war started, the building of bunkers, underground facilities and entrenchments all over Europe. Another part of the new German economy was massive rearmament, with the goal being to expand the 100,000-strong German Army into a force of millions. The Four-Year Plan was discussed in the controversial Hossbach Memorandum, which provides the "minutes" from one of Hitler's briefings. Some use the Hossbach Memorandum to show that Hitler planned a war in Eastern Europe in the pursuit of Lebensraum, believing that the Western powers of the United Kingdom and France would not intervene, leaving him free to take over the USSR, the "natural enemy" of Germany. However, this intentionalist view is disputed. Although the Four-Year Plan technically expired in 1940, Hermann Göring had built up a power base in the "Office of the Four-Year Plan" that effectively controlled all German economic and production matters by this point in time. In 1942, the growing burdens of the war and the death of Todt saw the economy move to a full war economy under Albert Speer. Traditional and masculine values in German culture were sought to be restored by the regime. All attempts at "artistic experimentation" and "sexual freedom" were repressed. The visual arts were strictly monitored and traditional, focusing on exemplifying Germanic themes, racial purity, militarism, heroism, power, strength, and obedience. Modern abstract art and avant-garde art was removed from museums and put on special display as "degenerate art", where it was to be ridiculed. In one notable example on March 31, 1937, huge crowds stood in line to view a special display of "degenerate art" in Munich, while a concurrent exhibition of 900 works personally approved by Adolf Hitler attracted a tiny, unenthusiastic gathering. Art forms considered to be degenerate included Dada, Cubism, Expressionism, Fauvism, Impressionism, New Objectivity, and Surrealism. Literature made by Jewish, other non-Aryans, or authors opposed to the Nazis were destroyed by the regime. The most infamous destruction of literature was the book burnings of 1933. In 1933, Nazis burned works of Jewish authors, and other works considered "un-German" in Berlin. Two major displays of Nazi German art and culture were at the 1936 Summer Olympics and at the German pavilion at the 1937 International Exposition or world fair in Paris. The 1936 Olympics was meant to display to the world the Aryan superiority of Germany to other nations. German athletes were carefully chosen not only for strength but for Aryan appearance. However one common belief of Hitler snubbing African-American athlete Jesse Owens has recently been discovered to be technically incorrect, it was African-American athlete Cornelius Cooper Johnson who was believed to have been snubbed by Hitler, who left the medal ceremonies after awarding a German and a Finn medals. Hitler claimed it was not a snub, but that he had official business to attend to which caused him to depart. Hitler was criticized for this and the Olympic committee officials then insisted Hitler greet each and every medalist or none at all. Hitler opted for the latter and skipped all further medal presentations. When Jesse Owens won his four medals, Hitler was not attending any of the medal ceremonies. Despite the official attempt to forge a pure Germanic culture, architecture under Hitler's personal guidance, was neoclassical, a style based on architecture of ancient Rome. Various Roman buildings were examined by state architect Albert Speer for architectural designs for state buildings. 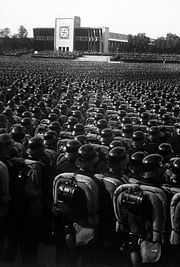 One design that was pursued but never build, was a gigantic version of the Pantheon in Rome, called the Volkshalle to be the semi-religious center of Nazism in a renamed Berlin called Germania, that was to be the "world capital" (Welthauptstadt). The design was impractical to construct because of its size and was pushed aside for attention to the war effort in World War II. In recent years a link between Nazi Germany and environmentalism has been discovered in a number of articles and books. According to reviews of the book How Green Were the Nazis?, this is one of the first more balanced analyses of the topic to emerge. In 1935 the regime enacted the "Reich Nature Protection Act," while not a purely Nazi piece of legislation since parts of its influences pre-dated the Nazi rise to power, it nevertheless reflected Nazi ideology. The concept of the "Dauerwald" was promoted, best translated as the "perpetual forest," which included concepts such as forest management and protection. Efforts were also made to curb air-pollution. In practice, the enacted laws and policies met resistance from various ministries that sought to undermine them, and from the priority that the war-effort took to environmental protection. Environmentalism was in the end often sacrificed for the sake of other goals of the state. In the end some of the efforts were negated by the Allied occupation. Timber exports from the U.S. occupation zone were particularly heavy. Sources in the U.S. government stated that the purpose of this was the "ultimate destruction of the war potential of German forests." As a consequence of the practiced clear-felling extensive deforestation resulted which could "be replaced only by long forestry development over perhaps a century." The "Danzig crisis" peaked in the months after Poland rejected Nazi Germany's initial offer regarding both the Free City of Danzig and the Polish Corridor. After a series of ultimatums, Germany broke diplomatic relations, and invaded Poland on 1 September 1939. This led to the outbreak of the Second World War in Europe when, on September 3, 1939, the United Kingdom and France declared war on Germany. The Phony War followed. On April 9, 1940 the Germans struck north against Denmark and Norway, partly to secure the safety of iron ore supplies from Sweden through Norwegian coastal waters. British and French forces landed in the north but were defeated in the ensuing Norwegian Campaign. In May, the Phony War ended when, despite the protestations of many of his advisors, Hitler took a gamble and sent German forces into France and the Low Countries. The Battle of France was an overwhelming German victory. Later that year, Germany subjected the United Kingdom to heavy bombing during the Battle of Britain, and deliberately bombed civilian areas in London. Hitler aimed to either pave the way for an invasion, Operation Sea Lion, or to persuade the British populace to make peace with Germany. The United Kingdom refused to capitulate. Sea Lion was indefinitely postponed. Instead, Hitler launched his invasion of the Soviet Union, Operation Barbarossa. Barbarossa was briefly postponed while Hitler's attention was diverted to bail out his failing Italian ally in North Africa and the Balkans. The Afrika Korps arrived in Libya in February of 1941. In what was to be one of many advances in the North African Campaign, the Germans took back much of what the Italians had given up. In April, the Germans invaded Yugoslavia, which was followed by the Battles of Greece and of Crete. It took four months to subdue North Africa and the Balkans, which delayed Barbarossa until late in June. 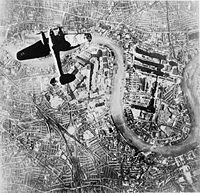 German bomber over London in 1940. In the West, the United Kingdom emerged as victor in the in the Battle of Britain and Germany turned to its navy, the Kriegsmarine, to raid North Atlantic convoys sending Britain supplies from the United States, Canada, and British colonies. British forces were forced to spread out to protect their convoys from submarine attacks, as well as stopping surface raiders. The British successfully repelled many German surface raiding attempts, famously pursuing and sinking the battleship Bismarck in 1941. Over time, the Allies developed improved defense tactics and new escorts that managed to reduce the numbers of merchant ships sunk. The German war machine managed to keep up with the steady losses of U-Boats because of their simple designs which allowed the U-Boats to be mass-produced and still remain a threat to the Allies throughout the war. 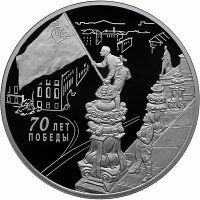 Germany invaded the Soviet Union on June 22, 1941. On the eve of the invasion, Hitler's former deputy, Rudolf Hess, attempted to negotiate terms of peace with the United Kingdom in an unofficial private meeting after crash-landing in Scotland. These attempts failed and he was arrested. 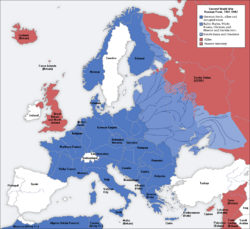 By late 1941, Germany and its allies controlled almost all of mainland and Baltic Europe with the exception of neutral Switzerland, Sweden, Spain (debated whether it was an Axis ally), Portugal (debated), Liechenstein, Andorra, Vatican City(arguably an Italian dependent state), and Monaco. On the eastern front, the German Army was at the gates of Moscow and engaged in a long winter war with the Red Army. Eventually the German army was forced out of Moscow, but held much of the Baltic territories spanning to the Black Sea. Nazi Germany declared war on the United States on December 11, 1941, four days after the Japanese bombed Pearl Harbor. German submarines in the Atlantic could now fight U.S. convoys that had been supporting the United Kingdom. Hitler was convinced of the United States' aggressive intentions following the leaking of Rainbow Five and hearing of the foreboding content of Franklin Roosevelt's Pearl Harbor speech. Before then, Germany had practiced its own policy of appeasement, taking drastic precautions in order to avoid the United States' entry into the war. The persecution of minorities and "undesirables" continued throughout German-held territory. From 1941 onward, Jews were required to wear a yellow badge in public and most were transferred to ghettos, where they remained isolated from the rest of the population. In January 1942, at the Wannsee Conference and under the supervision of Reinhard Heydrich, a plan for the "Final Solution of the Jewish Question" (Endlösung der Judenfrage) in Europe was hatched. By the end of the war some six million Jews and many others, including homosexuals, Slavs, and political prisoners, were systematically killed while more than ten million people were put into forced labor. This genocide is called the Holocaust in English and the Shoah in Hebrew. Thousands were shipped daily to extermination camps (Vernichtungslager, sometimes called "death factories") and concentration camps (Konzentrationslager, KZ), some of which were originally detention centers but later converted into death camps for the purpose of killing their inmates. The Nazis also conducted a ruthless program of conquest and exploitation over the captured Soviet and Polish territories and their Slavic populations as part of their Generalplan Ost. 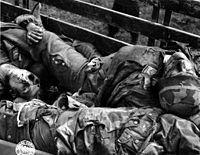 According to estimates, 20 million Soviet civilians, three million non-Jewish Poles, and seven million Red Army soldiers died under Nazi maltreatment in what the Russians call the Great Patriotic War. The Nazis' plan was to extend German Lebensraum ("living space") eastward, a foreseen consequence of the war in Eastern Europe and the Soviet Union, said by the Nazis to have been waged in order "to defend Western Civilization against Bolshevism." Due to many of the atrocities suffered under Stalin, the Nazi message was interpreted by many to be legitimate. Many Ukrainians, Balts and other disillusioned Soviets fought, or at least expected to fight, with the Germans, not to mention other Europeans enlisted in numerous Schutzstaffel divisions. 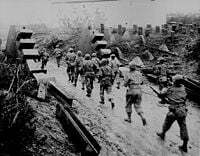 American soldiers cross the Siegfried Line, the border between Germany and France. As the Soviet war economy recovered despite the loss of industrial territory to the German occupiers, the Red Army put up a strong front against the German army. By 1943 the Soviets had defeated the Germans at Stalingrad and began the push westward, winning the tank battle at Kursk-Orel in July. From 1942, the Western Allies stepped up bombing raids and began plans to land on German-occupied territory. The Allied bombings of German cities resulted in the complete destruction of the cities of Cologne and Dresden. These bombings resulted in numerous civilian casualties and severe hardship for the survivors living amid the destroyed infrastructure. The invasion of Italy as well as the collapse of the Fascist regime there, caused German forces to be spread thin to fight the two fronts. The German Army was pushed back to the borders of Poland by February 1944, following the great success of Operation Bagration. The Allies opened a Western Front in June 1944 at Normandy, a year and a half after the Soviets turned the tide on the Eastern Front. With a three front campaign, depleting oil and supply lines, and constant bombing by the Allies, German occupied territory was slowly taken by the Allies. As the Red army neared East Prussia, German civilians began to flee from East Prussia, West Prussia and Silesia en masse westward, fearing persecution by Soviet soldiers. Though there were atrocities committed by the western allies, many Germans believed that they would be safer under occupation by the Western Allied forces, than under the Soviet forces. More than two million German soldiers died in World War II. German paratroopers (Fallschirmjäger) killed by American soldiers are stacked in a cart. By early 1945, Soviet forces surrounded Berlin, American and British forces had taken most of western Germany and Soviet troops moving westward met Allied troops moving eastward at Torgau at the Elbe on April 26, 1945 (Cohen). With Berlin under siege, Hitler and other key members of the Nazi regime chose to live in the armored underground Führerbunker that was furnished like a palace, while the upper terrain of Berlin was constantly shelled by the Red Army. Despite evident total defeat, Hitler refused to surrender and intense street fighting continued in the war-torn ruins of Berlin between remnant German army forces, Hitler Youth, and the Waffen SS against the Red Army. This battle was known as the Battle of Berlin. The German forces by this time were severely depleted, large numbers of German children and the elderly were forced into conscription by the Nazis to fight against the Red Army in the remaining pockets of territory not controlled by the Red Army in Berlin. The Soviet Red Army takes the Reichstag in the ruins of Berlin in the last days of the war. On April 30, 1945, as the Battle for Berlin raged and the city was being over-run by Soviet forces, Hitler committed suicide in his underground bunker. Two days later, on May 2, German General Helmuth Weidling unconditionally surrendered Berlin to Soviet General Vasily Chuikov. Hitler was succeeded by Grand Admiral Karl Dönitz as Reich President only. Dönitz was not to replace Hitler as the Führer or even as the Reich Chancellor. The caretaker government Dönitz established near the Danish border unsuccessfully sought a separate peace with the Western Allies. On May 4–May 8, 1945, the remaining German armed forces throughout Europe surrendered unconditionally (German Instrument of Surrender, 1945). This was the end of Nazi Germany. With the creation of the Allied Control Council on July 5, 1945, the four Allied powers "assume[d] supreme authority with respect to Germany" (Declaration Regarding the Defeat of Germany, US Department of State, Treaties and Other International Acts Series, No. 1520). 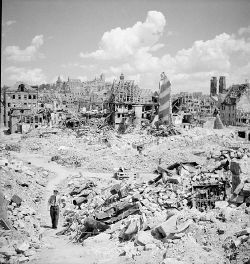 Nuremberg in ruins shortly after the unconditional surrender of the German armed forces. Like many German cities, it had been devastated by Allied carpet bombing. The Potsdam Conference in August 1945 created arrangements and outline for new government for the post-war Germany as well as war reparations and resettlement. 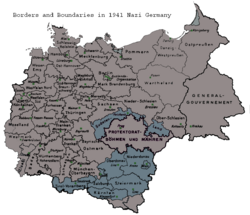 All German annexations in Europe after 1937, such as the Sudetenland, were reversed, and in addition Germany's eastern border was shifted westwards to the Oder-Neisse line, effectively reducing Germany in size by approximately 25 percent compared to her 1937 border. The territories east of the new border comprised East Prussia, Silesia, West Prussia, two thirds of Pomerania, and even parts of Brandenburg. These areas were mainly agricultural, with the exception of Upper Silesia which was the second largest center of German heavy industry. France took control of a large part of Germany's remaining coal deposits. Virtually all Germans in Central Europe outside of Germany and Austria were subsequently over a period of several years expelled, affecting about 17 million ethnic Germans. Most casualty estimates of this expulsion range between one to two million dead. The French, U.S. and British occupation zones later became West Germany (the Federal Republic of Germany), while the Soviet zone became the communist East Germany (the German Democratic Republic, excluding sections of Berlin). The initial repressive occupation policy in Germany by the Western Allies was reversed after a few years when the Cold War made the Germans important as allies against communism. West Germany recovered economically by the 1960s, being called the economic miracle (German term Wirtschaftswunder), mainly due to the currency reform of 1948 which replaced the Reichsmark with the Deutsche Mark as legal tender, halting rampant inflation, but also to lesser degree helped by economic aid through the Marshall Plan which was extended to also include West Germany in 1949, and upheld thanks to fiscal policy and intense labor, eventually leading to labor shortages. Allied dismantling of West German industry was finally halted in 1950. In 1955 the military occupation of West Germany was ended. In contrast, East Germany recovered at a slower pace under Communism until 1990, due to reparations paid to the Soviet Union and the effects of the centrally planned economy. Germany regained full sovereignty in 1991. After the war, surviving Nazi leaders were put on trial by an Allied tribunal at Nuremberg for crimes against humanity. A minority were sentenced to death and executed, but a number were jailed and then released by the mid-1950s, due to poor health and old age. In the 1960s, 1970s and 1980s, some renewed efforts were made in West Germany to take those who were directly responsible for "crimes against humanity" to court (e.g., Auschwitz trials). However, many of the less prominent leaders continued to live well into the 1980s and 1990s. The leaders of Nazi Germany created a large number of different organizations for the purpose of helping them stay in power. They rearmed and strengthened the military, set up an extensive state security apparatus and created their own personal party army, the Waffen-SS. The government of Nazi Germany gradually formed into a process known as "working towards the Führer." Although Hitler was the undisputable ideological force behind the third Reich, as leader of the country, he was very lazy, especially in the pre-war years, spending much of his time relaxing in his mountain retreat. Because of this, a system of government was formed whereby leading Nazi officials were forced to interpret Hitler's random speeches and rants on government policies, often based on chance overhearings, or off-the-cuff remarks, and turn them into legislation. This created an elite of ambitious Nazis, all of whom were desperate to win the approval of the Führer, and all of whom despised one another. Any government member could take one of Hitler's comments, and turn it into a new law, of which Hitler would casually either approve or disapprove when he finally heard about it. This became known as "working towards the Führer," as the government was not a co-ordinated, co-operating body, but a collection of individuals each trying to gain more power and influence over the Führer. This often made government very convoluted and divided, especially with Hitler's vague policy of creating a multitude of often very similar posts. The process allowed more unscrupulous and ambitious Nazis to get away with implementing the more radical and extreme elements of Hitler's ideology, such as anti-Semitism, and in doing so win political favor. Protected by Goebbels' extremely effective propaganda machine, which portrayed the government as a dedicated, dutiful and efficient outfit, the dog-eat-dog competition, and chaotic legislation was allowed to escalate out of control. Historical opinion is divided between "intentionalists" who believe that Hitler created this system as the only means of ensuring both the total loyalty and dedication of his supporters, and the complete impossibility of a conspiracy; and the "structuralists" who believe that the system evolved by itself, and was a serious limitation on Hitler's supposedly totalitarian power. Through staffing of most government positions with Nazi Party members, by 1935 the German national government and the Nazi Party had become virtually one and the same. By 1938, through the policy of Gleichschaltung, local and state governments lost all legislative power and answered administratively to Nazi party leaders, known as Gauleiters, who governed Gaue and Reichsgaue. President of the (Hermann Göring) was President of the Reichstag (legislature) but as the Third Reich was a totalitarian state, Parliament had little power. After 1933, the Reichsregierung (cabinet) was able to legislate without Parliament's approval. Most of the judicial structures and legal codes of the Weimar Republic remained in use during the Third Reich, but significant changes within the judicial codes occurred, as well as significant changes in court rulings. Most human rights of the constitution of the Weimar Republic were disabled by several Reichsgesetze (Reich's laws). Several minorities such as the Jews, opposition politicians and prisoners of war were deprived of most of their rights and responsibilities. The Plan to pass a Volksstrafgesetzbuch (people's code of criminal justice) arose soon after 1933 but didn't come into reality until the end of World War II. As a new type of court, the Volksgerichtshof (people's court) was established in 1934, only dealing with cases of political importance. From 1934 to September 1944 5,375 death sentences were spoken by the court. Not included in this numbers are the death sentences from July 20, 1944, until April 1945, which are estimated at 2000. Its most prominent member was Roland Freisler who headed the court from August 1942 to February 1945. ↑ Germany—Country Study Retrieved April 17, 2017. ↑ realm. dictionary.referernce.com. Retrieved April 17, 2017. ↑ "Kaisertum" is more likely to show the imperial dignity of type of government. ↑ Günter Bischof, “The Historical Roots of a Special Relationship: Austro-German Relations Between Hegemony and Equality.” In Unequal Partners, ed. Harald von Riekhoff and Hanspeter Neuhold, (San Francisco: Westview Press, 1993). ↑ Janusz Gumkowkski and Kazimierz Leszczynski, Poland under Nazi Occupation (Polonia Pub. House, 1961). ↑ 6.0 6.1 6.2 Richard Evans. The Coming of the Third Reich (New York: Penguin Books, 2003), 441. ↑ "Lubbe, Marinus van der," Lubbe, Marinus van der. libcom.org. Retrieved April 26, 2017. ↑ Hartmut M. Hanauske-Abel, "Not a slippery slope or sudden subversion: German medicine and National Socialism in 1933" BMJ 313 (1996):1453-1463. Retrieved April 26, 2017. ↑ "1933 Law on Animal Protection," 1933 Law on Animal Protection. World Future Fund. Retrieved April 26, 2017. ↑ Hyde Flippo, The 1936 Berlin Olympics: Did Hitler Really Snub Jesse Owens at the 1936 Berlin Olympics?. Retrieved April 26, 2017. ↑ Rick Shenkman, Adolf Hitler, Jesse Owens and the Olympics Myth of 1936. History News Network February 13, 2002. Retrieved April 26, 2017. (article excerpted from Rick Shenkman's Legends, Lies and Cherished Myths of American History (New York: William Morrow & Co., 1988, ISBN 0688065805). ↑ Alexander Scobie, Hitler's State Architecture: The Impact of Classical Antiquity. (University Park: Pennsylvania State University Press, 1990. ISBN 0271006919), 92. ↑ Wilko Graf von Hardenberg, Review of Franz-Josef Brueggemeier, Marc Cioc, and Thomas Zeller, (eds. ), How Green Were the Nazis? : Nature, Environment, and Nation in the Third Reich. H-Net (October, 2006). Retrieved April 26, 2017. ↑ 15.0 15.1 Nicholas Balabkins. Germany Under Direct Controls; Economic Aspects Of Industrial Disarmament 1945-1948. (Rutgers University Press, 1964), 119. The two quotes used by Balabkins are referenced to respectively; A Year of Potsdam: The German Economy Since the Surrender. (U.S. office of Military Government, 1946), 70; and U.S. Office of Military Government, The German Forest Resources Survey (1948), II. For similar observations Balabkins also directs the reader in the footnotes to G. W. Harmssen. Reparationen, Sozialproduct, Lebensstandard. (Bremen: F. Trujen Verlag, 1948), Vol I, 48. Allen, William Sheridan. The Nazi Seizure of Power: the Experience Of A Single German Town, 1922–1945. New York; Toronto: F. Watts, 1984. ISBN 0531099350. Balabkins, Nicholas. Germany Under Direct Controls; Economic Aspects Of Industrial Disarmament 1945-1948. Rutgers University Press, 1964. Bridenthal, Renate, Atina Grossmann, and Marion Kaplan, eds. When Biology Became Destiny: Women in Weimar and Nazi Germany. New York: Monthly Review Press, 1984. ISBN9780853456421. Bracher, Karl Dietrich. The German Dictatorship; The Origins, Structure, and Effects of National Socialism. New York: Praeger, 1970. Brüggemeier, Franz-Josef, Mark Cioc, Thomas Zeller. How Green Were the Nazis? : Nature, Environment, and Nation in the Third Reich. Athens, OH: Ohio University Press, 2006. ISBN 9780821416464. Burleigh, Michael. The Third Reich: A New History. New York: Hill and Wang, 2001. ISBN 080909326X. Broszat, Martin. German National Socialism, 1919–1945, translated from the German by Kurt Rosenbaum and Inge Pauli Bohm. Santa Barbara, CA: Clio Press, 1966. Broszat, Martin. The Hitler State: The Foundation and Development Of The Internal Structure Of The Third Reich. London: Longman, 1981. ISBN 0582492009. Evans, Richard J. The Coming of the Third Reich. London: Penguin, 2004. ISBN 0141009756. Evans, Richard J. The Third Reich in Power. London: Penguin, 2005. ISBN 1594200742. Grunberger, Richard. A Social History of the Third Reich. London: Weidenfeld and Nicolson, 1974. ISBN 0140136754. Gumkowski, Janusz, and Kazimierez Leszczynski. Poland Under Nazi Occupation. Warsaw: Polonia Pub. House, 1961. Hildebrand, Klaus. The Third Reich. London: G. Allen & Unwin, 1984. ISBN 0049430335. Hillgruber, Andreas. Germany and the two World Wars. Cambridge, MA: Harvard University Press, 1981. ISBN 0674353218. Höhne, Heinz. The Order of the Death's Head: The Story of Hitler's SS, Translated by Richard Barry. London: Penguin Books, (1971), 2000. ISBN 9780141390123. Irving, David. Hitler's War. London: Focal Point Publications; NY: Viking, 1977. ISBN 9780670374120. Kershaw, Ian. The Nazi Dictatorship: Problems and Perspectives of Interpretation. London: Arnold, 2000. ISBN 0340760281. Koonz, Claudia. Mothers In The Fatherland: Women, the Family, and Nazi Politics. New York: St. Martin's Press, 1987. ISBN 0312549334. Peukert, Detlev. Inside Nazi Germany: Conformity, Opposition and Racism in Everyday Life. London: Batsford, 1987. ISBN 071345217X. Rothfels, Hans. The German Opposition to Hitler: An Assessment. London: Longwood Press Ltd. (1948), reprint 1970. ISBN 0854961194. Scobie, Alexander. Hitler's State Architecture: The Impact of Classical Antiquity. University Park: Pennsylvania State University Press, 1990. ISBN 0271006919. Shenkman, Rick. Legends, Lies and Cherished Myths of American History. New York: William Morrow & Co. 1988. ISBN 0688065805. Wheeler-Bennett, John. The Nemesis of Power: The German Army in Politics 1918–1945. London: Palgrave Macmillan, (1953), reprint 2005. ISBN 1403918120. Third Reich in Ruins—Photos taken during the Nazi regime compared to present-day locations. Hitler's Third Reich in the News—Daily edited review of Third Reich-related news and articles. This page was last modified on 26 April 2017, at 23:13.